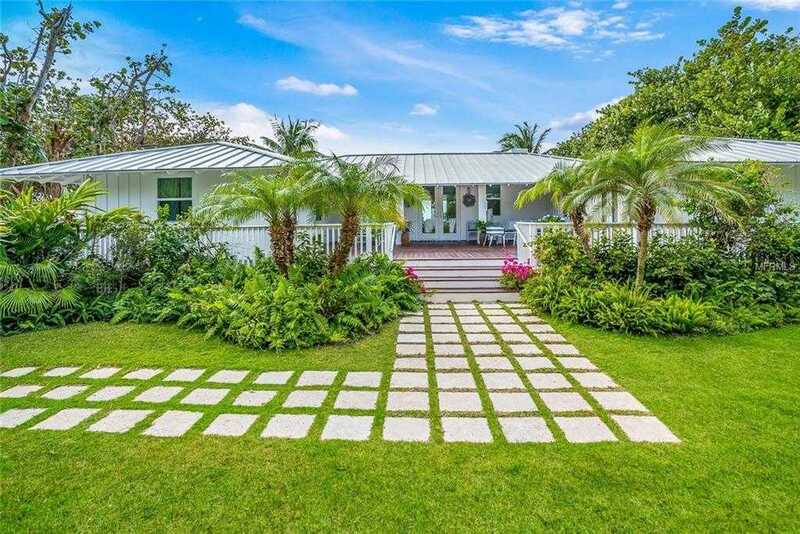 This casual and charming beachfront Key-West style residence is perfectly positioned on three lots with 150′ of Gulf of Mexico frontage. Built in 1973, this 3,000+ sq. foot three bedroom, three bath dwelling includes a beachfront guest cottage resulting in a rare assemblage of waterfront property. Beautifully upgraded in 2010 with a new kitchen, new metal roof to both residence, impact glass, and Bamboo flooring. The outdoors has been thoughtfully enhanced with a new pool, travertine walkways, tropical landscaping, a 6′ privacy wall in 2012, and a 3-ton air-conditioner in the main residence in 2017. The home is designed to emphasize Gulf views and natural light. The floor plan with wide wood plank accent walls are anchored by a spacious living/dining area with a gas fireplace, built-in cabinetry, French doors accessing a wrap around Ipe wood deck, and multiple areas to facilitate endless entertainment possibilities. The open kitchen/family room boasts ample built-in cabinetry, stainless steel appliances and concrete infused glass counters. A separate two bedroom, one and one-half bath guest cottage with Gulf views and a two car garage adjoins the main residence via an open deck walkway. Please, send me more information on this property: MLS# D6104250 – $8,000,000 – 1701 17th St W, Boca Grande, FL 33921. I would like to schedule a showing appointment for this property: MLS# D6104250 – $8,000,000 – 1701 17th St W, Boca Grande, FL 33921.